WHAT: I don't know the story behind these other than I've had them as long as I can remember. They originally belonged to my older brothers so I'm not sure exactly how or where they were sold. 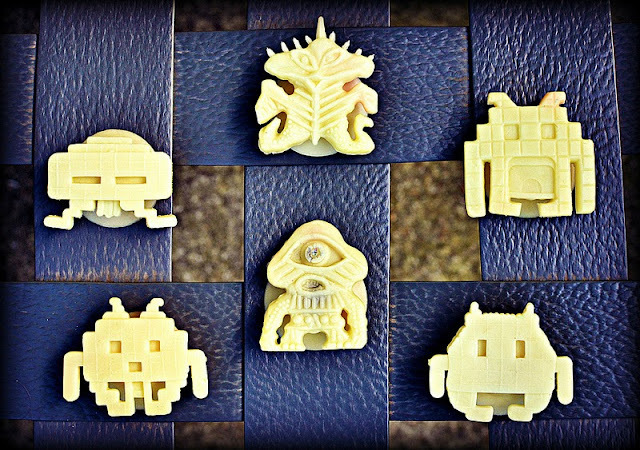 Each is a couple inches tall and made out of glow-in-the-dark rubber with suction cups on their backs so you can stick them to things. I have the six different kinds shown above--most of them appear to be creatures from the classic "Space Invaders" video game, although I'm not sure about the two guys in the middle. Has anyone else ever seen these before?